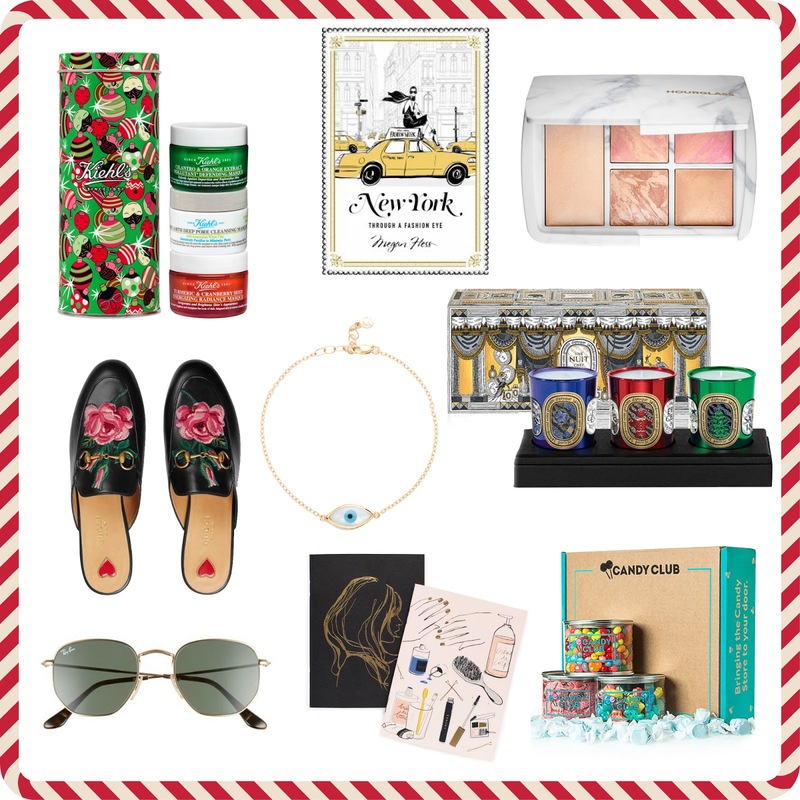 I know Christmas is right around the corner and a gift guide is a must for my blog! I have created a collection of great products that any woman would love to receive on Christmas morning! I know so many people loved last year's guide which I will link HERE in case you want to get some of those items. I have a mix of many stuff so I hope this helps! Kiehl's Mini-Masque Must-Haves Set: Skincare can be quite a personal item to buy someone because everyone has different skin types and certain products may not work for some people which is why this mask set is a perfect gift! Most masks work on every skin type and this one has a set of three of Kiehl's new face masks that target different skin concerns. These mini masks are packed with great ingredients and I highly recommend them. Kiehl's is overall one of my favorite skincare brands and all their products have always given me amazing results. Also, the packaging is adorable! New York: Through a Fashion Eye by Megan Hess: If you love illustrations, you will love going through the pages of this book. It is an illustrated guide to New York City and it's glamorous fashion. From Chanel to Dior, Bloomingdales to Bergdorf Goodman, Megan Hess has drawn for some of the most prestigious fashion brands around and brings it all to you in this amazing book! This could be a great stocking stuffer or part of a gift for those girly girls who love fashion books. Diptyque Holiday Candle Trio (Limited Edition): Every year I love seeing the new Christmas candles from Diptique. I love their gorgeous packaging and scents. Any girl would be super excited to receive this set especially if she is a candle lover. Diptique candles are something not everyone would buy for themselves which is why they are even more special. Hourglass Ambient Lighting Surreal Light Blush, Bronzer & Strobe Powder Palette: First off, the packaging of this palette is super chic and the marble effect is everything I want to see in a modern day palette. This limited edition palette is amazing because it has a variety of powders from blush, bronzer, finishing powder and a highlight, basically, everything you will need for a perfect glow! Hourglass has always nailed their powders and created the highest quality and I don't expect less from this palette. Any beauty lover would love this in her collection. Gucci Princetown Leather Loafers: This is a more luxurious gift for the woman in your life and if you really want her to be ecstatic you can't go wrong with these stunning shoes. Gucci has really changed their brand around with unique and super cool trends which include these loafers. They come in so many different designs and colors. They also have ones that are not slippers and closed at the back. A ton of options for you to pick from which is always convenient. I think they go well with every outfit and are for the classic yet stylish girl. Mejuri Evil Eye Bracelet: Every girl loves a piece of jewelry which is why this bracelet is a great gift this Christmas. Last year, I featured the Mejuri evil eye ring and this time I went with the Mejuri Evil Eye bracelet. I love the jewelry from Mejuri because even though they create classic pieces, it has a gorgeous twist on it. Their delicate chain items are designed beautifully and are crafted with the best materials. I am still eyeing the ring from last year's guide, but if you already have that or are looking for a bracelet instead, this is your best bet. Rifle Paper Co. Notebooks: If I ever need any stationery my one stop shop is Rifle Paper Co. They have the best collection of stationery with the most pretty illustrations. I think everyone needs a planner or notebooks in their daily life and this has a variety of designs that you can pick from. This specific notebook set is the Beaute' created in partnership with French illustrator, author, and photographer Garance Doré. A perfect stocking stuffer too! Rayban 51mm Oval Aviator Sunglasses: If you are a fan of the classic aviator round sunglasses, these are the latest and the new twist to the classic pair. A girl cannot have enough sunglasses and I specifically picked this design because it looks good on so many people. They are also Rayban and comparatively affordable to the other sunglasses out there. I just love these and I know another girl would too. Candy Club Subscription Box: I love to add a subscription box to my gift guide because they are unique and who doesn't want to receive a surprise in the mail every month. There are so many new subscriptions boxes out there, but this one caught my eye immediately. This one is great for the foodie or sweet tooth gal. I love the concept of this box because you can get a mix of candy every month and also take a quiz on what your taste is, likes and dislikes for future candy. They have a huge candy selection that is curated for everyone to love. Gift Cards: I know this one isn't as personal, but a lot of people prefer to just get gift cards to pick their own products. This is also a great stocking stuffer and good for people you don't know personally. There are so many stores you can pick a gift card from. I hope this gift guide helps some of you to find the best gift for your loved one!